If you own a firearm, cleaning it on a regular basis is essential for its proper maintenance. That’s why most gun owners are as passionate about finding the best gun cleaning kit as they are about the weapons. Cleaning guns is serious business. Only clean guns fire as expected and perform perfectly well without issues. When a weapon is shot, the passing bullets leave debris and residue inside the chamber and the barrel. If this reside builds up over time, it can hinder the proper firing of a shot. Not to mention, power residue might even cause bullets to jam. Most gun owners take pride in having clean guns. It should be noted that rarely using your weapon or locking it up in a safe is not enough to keep it clean. In addition to residue, the moisture in the air can also cause rusting in parts of certain gun models. Unclean guns don’t last long or fire the way you intend them to. The easiest way to keep your weapons clean is to purchase a good kit, which will make keeping your weapon free of residue less of a chore and more a joy. There are an astonishing number of cleaning kits currently available in the market. Choosing one out of many can be difficult. Most gun owners don’t know which ones are best until they have tried the kits themselves. To save the hassle of spending money on dozens on gun cleaning kits, read ahead for a list of excellent choices. This kit is highly capable and very portable, and makes cleaning multiple weapons at a time a lot easier. The manufacturer recommends this kit for armorers, but it’s very suitable for at-home or casual outdoor use as well. This is a full-spec cleaning kit suitable for cleaning.17 to .50 caliber pistols, .410 to 12/10 gauge shotguns, .17 to .50 caliber rifles, and all inline muzzle loaders. The cleaning equipment includes a full set of bronze bore and chamber cleaning brushes. One of the biggest problems many gun owners face is how to clean the copper residue inside barrels of firearms. These brushes are perfect for just that purpose. They can reach inside barrels of any type of weapon. You will also benefit from the 100% cotton patches designed to be suitable for all caliber weapons, especially the small ones. The cotton pads can also be used to clean weapons with holographic sight as well. Other items in the kit include an all-purpose nylon receiver brush, six Memory-Flex cleaning rods, three slotted tips, a T-handle bar, patch savers (both small and large), a bore reflector/flag safety, and two 5-ounce tubes of Otis O85 Ultra Bore solvent. In case you have weapons with blocked barrels or with jamming issues, the obstruction removal tools that come with this kit will be a lifesaver. On top of all these perks, the kit comes with a gun maintenance guide. This kit is perfect for precision cleaning and breech to muzzle cleaning. There are over 40 cleaning items included in the accompanying nylon case. If you are looking for an all-purpose cleaning kit that you can also take out on hunting trips, this is the kit you need. You may already be familiar with this trusted brand. 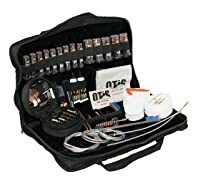 This is one of the best universal gun maintenance kits that suits weapons of almost all calibers. If you own multiple weapons, this kit will save you the inconvenience of owning numerous cleaning products. This kit comes with handy Rem Squeeg-E that can remove all types of dislodged barrel debris. One pass and this gel will get the job done without wasting your time. There are Rem Flex Rods provided to protect the finish of barrels. The rods are quite sturdy as well. There’s a Rem pad provided to keep the gun safe from scratches and other issues while you clean. (For larger rifles, you might want to consider something like bipod for ar15.) The pad is machine washable and comes in a bag with a Velcro tape for easy storage. Other items in the kit include Rem All-In Bore Cleaner, a high performance substance that will remove any carbon, copper, or plastic fouling or residue. The essential tools provided are two large cleaning brushes, brush revolver, Rem gun oil, and standard gun cloth. All cleaning supplies provided are of top quality. The bag that comes with the kit has extra pockets for extra cleaning supplies as well. This kit is ideal for hunters, but others will find great use for it as well. This 68-piece kit costs less than a 100 bucks. If you are looking for an affordable but high quality set, you don’t need to look further than this one. The wide assortment of cleaning items are quality tested in the U.S.A. and come tucked in a soft-sided case. The kit has one of the best collections of bronze brushes that will be suitable for 14 different types of calibers, including narrow caliber ranges. Matching mops come with the brushes as well. The brushes and the mops each have suitable calibers stamped on to the metal shaft tip for easy identification. It’s not a sticker so you won’t lose the marking with prolonged use. 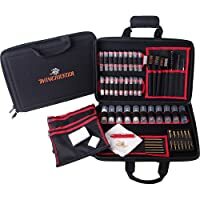 Other items in the kit include 150 cotton patches (50 each for 3 different sizes), slot tips of 4 different sizes, a collection of nylon, bronze and stainless steel utility brushes, and a 13-piece solid brass jag set that precisely matches calibers from .17 up to .50. Sturdy brass rods for both handguns and long guns are included too. Even with all these items, the case has space for extra items like cleaning solutions, night sight, and screwdrivers. 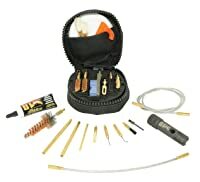 This kit is suitable for cleaning the usual small handguns and rifles in .17, .22, .30, .204, .243, and .270/280 calibers. The has equipment for cleaning medium to large handgun calibers 9mm/.38, .357, .40, .44 and .45. Also, this is one of those rare kits suitable for cleaning unusually large .50 and .540 caliber weapons. Commonly used shotgun calibers (12 gauge, 20 gauge, and .410) can easily be cleaned as well. If you have a large and varied collection of weapons, this kit would be extremely convenient and useful. The best gun cleaning kit is the one that suits your needs to most. If you own multiple guns of different types, purchasing a universal cleaning kit like the Remington Hunting Cleaning and Maintenance Kit or the Otis Tactical Cleaning System will be very convenient. If you are a pistol owner, you will benefit best from a specialty kit like Hoppe’s that’s designed especially for weapons of specified calibers. You may also want to consider a kit like Remington, Otis, or Hoppe’s if you are planning on packing the cleaning kit on hunting or camping trips. On the other hand, Outers 25 cleaning chest can be a delightful addition to a strictly at-home gun cleaner. Quality wise, all of the above listed products offer the best equipment. Brands like Remington and Hoppe’s are well known and respected, so there’s a certain trustworthiness that comes with brand recognition. The Remington kit has more accessories than others, but you can hold more if you have Outers 25. I totally agree with you. I haven’t tried other gunsmithing and cleaning tools aside from Remington and Wheeler, but this article is worth reading especially if you are a gun enthusiast. I will definitely come back and read more of your posts.